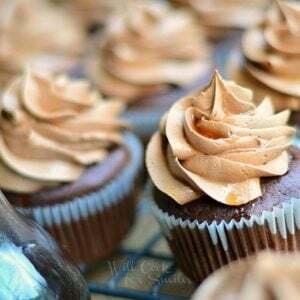 You will want to make these Bourbon Chocolate Cupcakes with Chocolate Buttercream Frosting topped with sweet Bourbon Glaze. Please note: recipe contains alcohol and raw eggs. In a small sauce pot, mix water with unsweetened cocoa powder. Bring to a low boil and stir in bourbon. Cook for about a minute and set aside to cool. Separately, whisk together the vegetable oil, vanilla extract, eggs and sour cream. Lower the speed to low again and slowly pour in the hot cocoa. Mix until just combined. Turn off the mixer. Using the spatula, scrape the sides and the bottom of the bowl, continue mixing with the spatula until the batter is smooth. Pour patter into the cupcake liners, filling them about 3/4 of the way, and bake for 18-20 minutes. So a toothpick test at 18 minutes to check for doneness. Glaze should be prepared ahead of time to allow it enough time to cool before adding to cupcakes. In a small sauce pot, over medium heat, whisk sugar and bourbon together and bring it to simmer. Cook for about 10-15 minutes, until the mixture is reduced in half. Cool completely. Warm the chocolate in a double boiler or in the microwave until melted and allow to cool slightly. Beat butter until it is fluffy (about 3-5 minutes) high speed, lower the speed to low and add in icing sugar and the egg yolk alternately, beating after each addition. The mixture should be very fluffy. With the mixer on medium low, gradually drizzle in melted chocolate. Transfer the frosting to the pastry bag and frost the cooled cupcakes. After the cupcakes are frosted, slowly drizzle with the glaze from the top, letting it pour down, and have some of it run off into the liner, that way it gets to the cupcake under the cupcake liner.